For a company that delivers true hospitality for millions of guests every year, the pressure was on to provide IHG with five star accommodation. Thankfully, they had ample space for us to create engaging new work spaces, meeting areas and communal facilities. 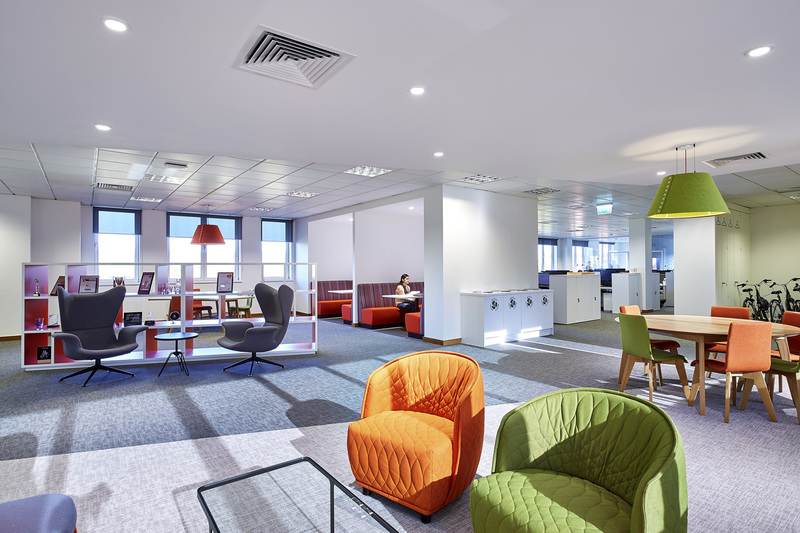 The result is a fit out that provides a fresh and contemporary home for their multigenerational workforce. We wanted staff to feel they were entering somewhere wonderful when they entered their office each and every day. We took inspiration from IHG's diverse portfolio of hotels to create a welcoming atrium retreat that acts as the gateway to the office; hosting the staff cafe, gym and casual working areas. 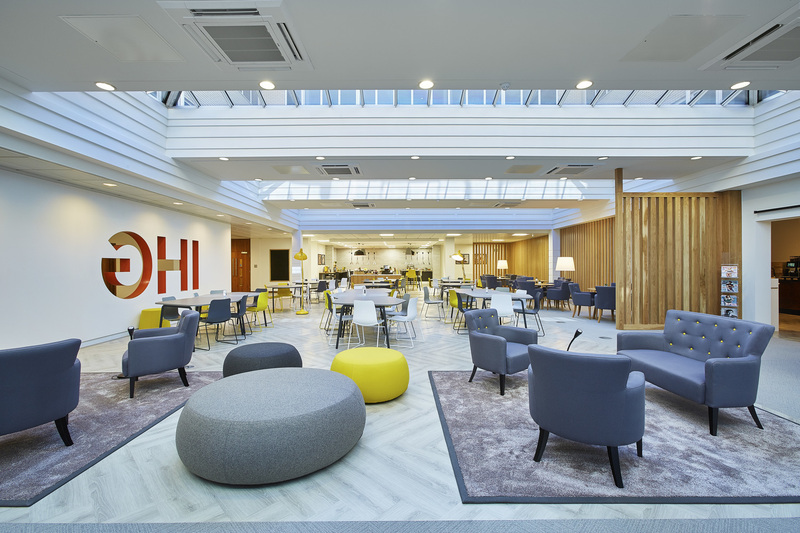 This hotel-inspired space is the perfect reflection of their brand; from the over-sized IHG logo on the entrance wall, to the soft furnishings and lighting reflecting that reflect warm colour pallete. This space was not only designed to house the staff restaurant, but also double as a casual working space for staff to get away from their desk, or hold more casual meetings; perfect with a coffee from the adjoining cafe. IHG wanted staff to have both dedicated and alternate work spaces. We were able to give staff their own dedicated workstation, along with extra breakout and activity-based working spaces. This allows staff to be able to work from across the office, in a space suited to the job at hand. These high-backed sofas are a great way to create a more private and intimate feeling in an otherwise open space, offering privacy without requiring a full meeting room bookings. 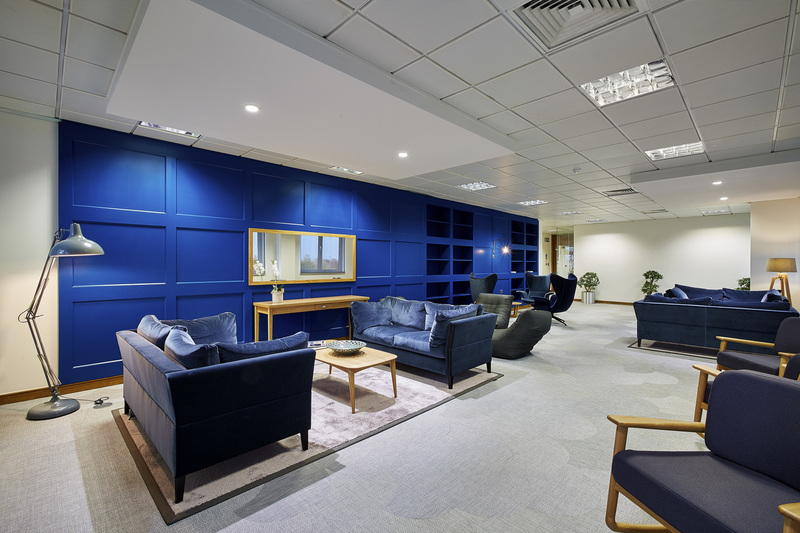 As with an modern office fit out, technology was a key enabler to keeping staff connected; both across the globe and throughout this near 50,000 sq ft office space! Technology was integrated to enable staff to work across the different working zones in the three floor office. New video conference facilities were installed in the meeting rooms to bring employees across the UK (and the globe) closer together than before. IHG's hotels often have it all with a range of guest facilities, and they wanted their staff to have access to the same level of variety offered at their best properties. This starts on the ground floor, where the cardio gym is perfect for a quick lunchtime run or rowing session to let off some steam. 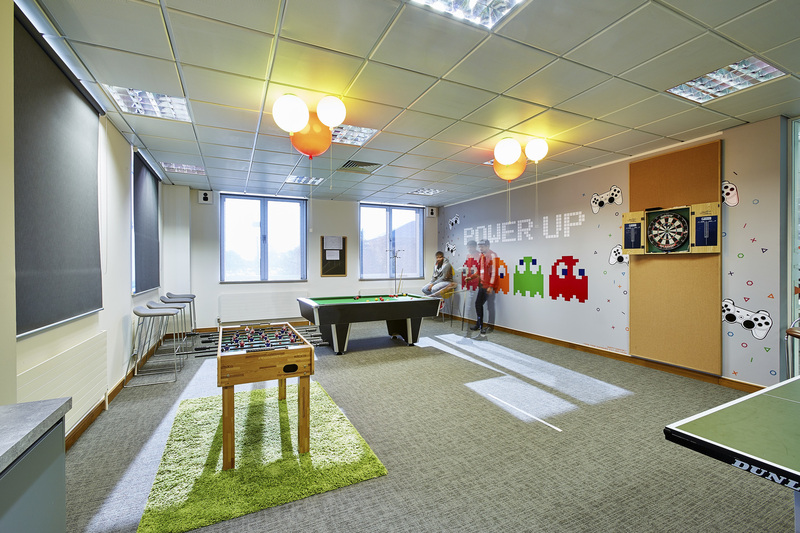 On the second floor, this diverse games room allows staff to relax, wind-down and briefly checkout from their working day over a game of foosball, pool or darts. 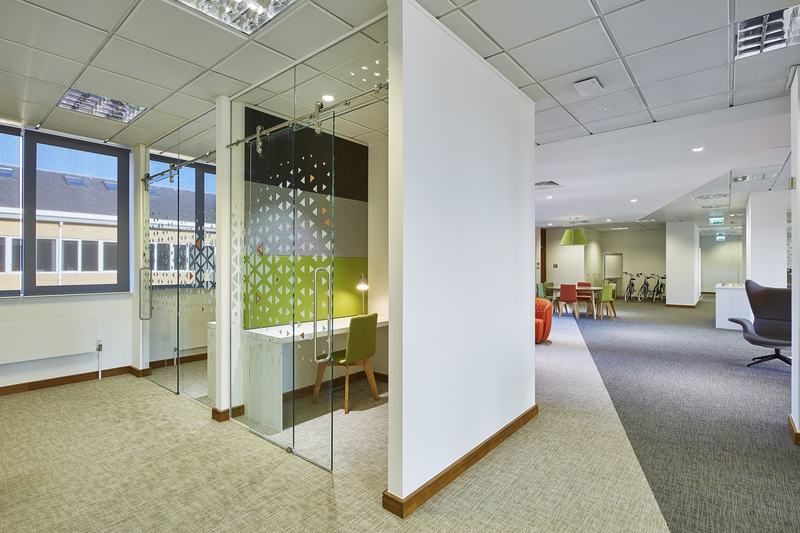 Scattered throughout the working floors are various activity-based working areas that allow staff to move away from their desk to an area more suited to their current task. Small movements like this do wonders to promote staff's physical wellbeing. It's been proven that access to natural light can promote wellbeing, regulate your sleep and even boost staff's productivity. As sole tenants, IHG has access to all four corners of the building, so we made sure that natural light was maximised throughout the fit out. The first and second floors are based around the central glass-roofed atrium, which houses the office's main casual working and cafe area. Staff workstations were then situated around the periphery of the building, ensuring consistent access to natural light in those areas that will have the highest daily occupancy. Smaller meeting rooms and group huddle spaces that are usually used for shorter periods of time, face the internal section of the building. Just like at their most luxurious properties, the staff retreat is finished with the utmost attention to detail, and with the finest materials. 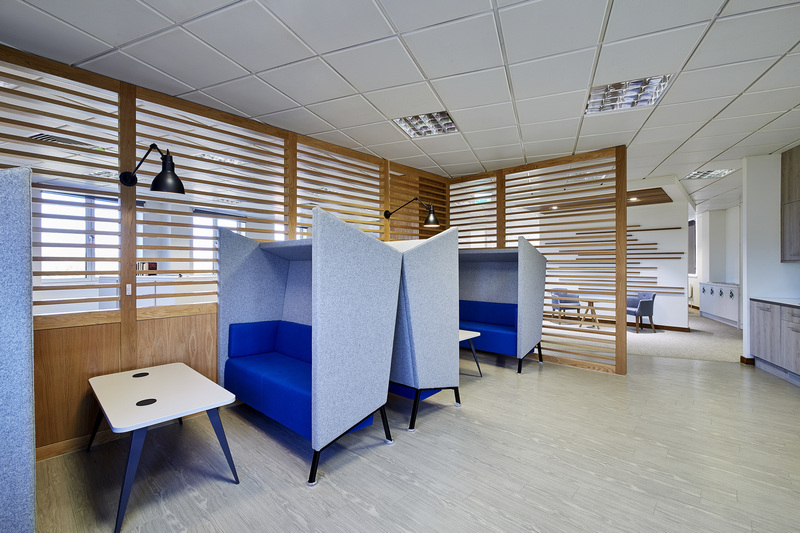 More than simply a breakout area, this space is designed to allow staff to truly unwind and relax, with a 'no tech' policy in place, staff are able to disconnect and recharge. Select the key areas from the showcase reel, then navigate around the entire office at your own pace. This is best viewed on your mobile or tablet for the full experience.